Brett Fontaine collects his batting helmet after a collision with catcher Joe Barry at home in the fifth inning. 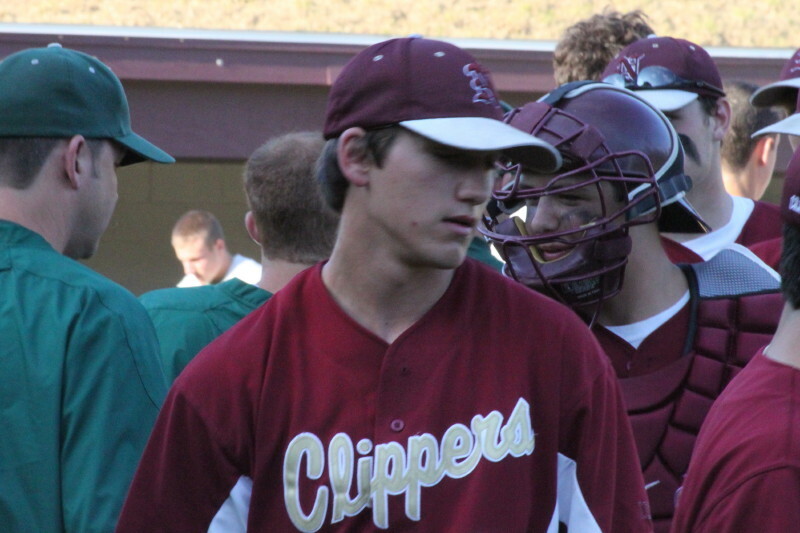 Brett pitched a four-hitter and drove in two runs for Newburyport. Ryan O’Connor congratulates Coach Bill Pettingell for a win in his last home game. (Newburyport) Newburyport broke open a 2-2 game in the bottom of the fifth with six runs and went on to defeat Austin Prep, 8-3, on Lower Field at NHS on Monday afternoon. The victory in the quarter finals puts the Clippers (19-5) into the D3 North semi-finals against Bishop Fenwick on Thursday at a neutral site. Junior Brett Fontaine had a lot to do with the win as he pitched a complete-game four hitter and drove in two runs in the game-deciding fifth inning. 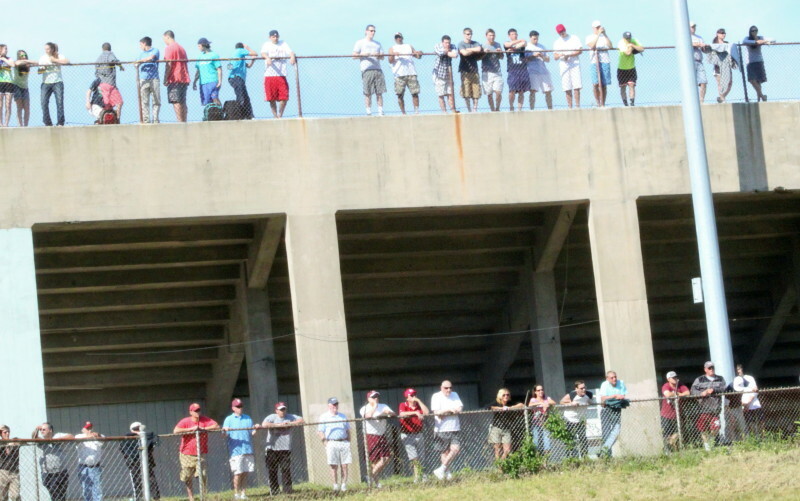 That fifth inning will be remembered as very good or very bad depending on where your loyalties were located. The Clippers will remember the six runs, five hits, and the successful execution of a suicide squeeze. For the Cougars (13-9), it’ll be the wild pitch, four walks, and mishandling the suicide squeeze. 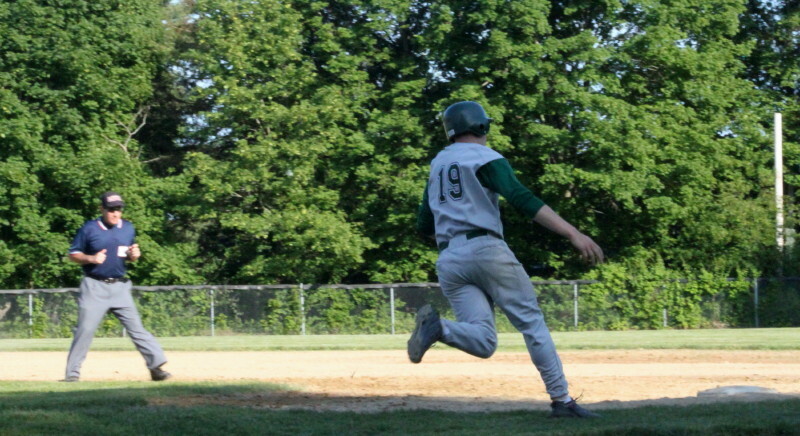 In that decisive fifth inning, Austin Prep coach Steve Busby opted to have starter Ryley MacEachern intentionally walk Matt Mottola to load the bases and pitch to Brett Fontaine. That didn’t work out so well for the Cougars as Brett singled to right and the Clippers fourth (Colton Fontaine) and fifth (Ryan O’Connor) runs came in. Later in the fifth, Connor Wile put down a suicide squeeze bunt with Brett Fontaine heading full-speed from third. 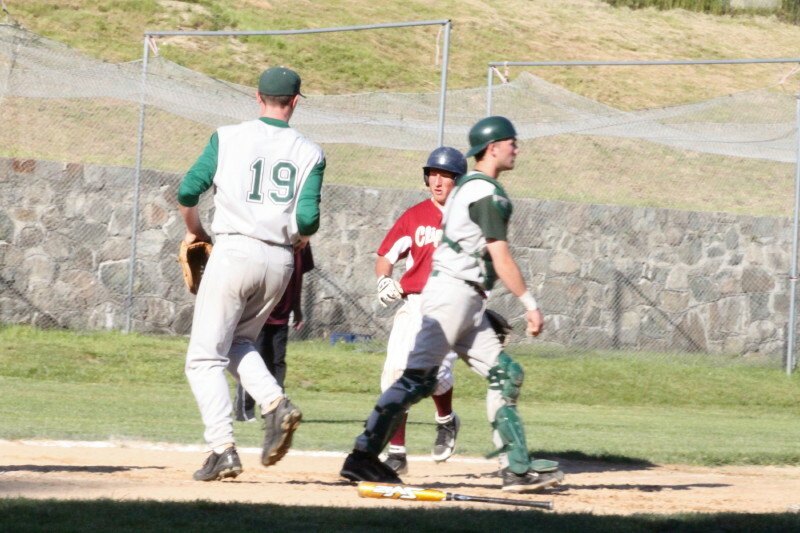 Cougar catcher Joe Barry blocked Brett away from the plate before he had the ball and the umpire awarded Brett home. Sam Barlow followed with a walk driving in the sixth run (Jim Conway) of the inning and boosting Newburyport’s advantage to, 8-2. Ryley MacEachern breaks into a home run trot after his shot over the left field fence in the sixth inning. Ryley MacEachern led off the sixth with a homer over the left field fence to make it 8-3 but the Cougars went quietly (one hit) the rest of the way. 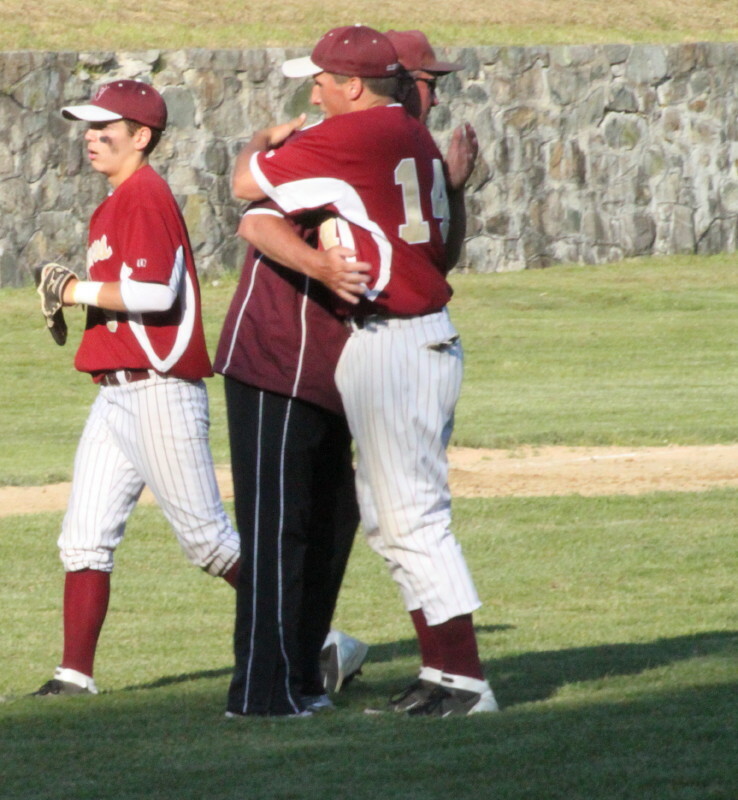 This was the last home game for Newburyport’s 600+ win coach Bill Pettingell. You could see/hear that he was fired up during this game. The weather was excellent with plenty of sunshine although I’m not sure that the left fielders for each team were that thrilled with the sun being directly in their eyes. Austin Prep put up a run in the first inning. Bobby Batchelor walked and reached third after a wild pitch and a fielder’s choice. He scored easily on Ryley MacEachern’s double to right center. 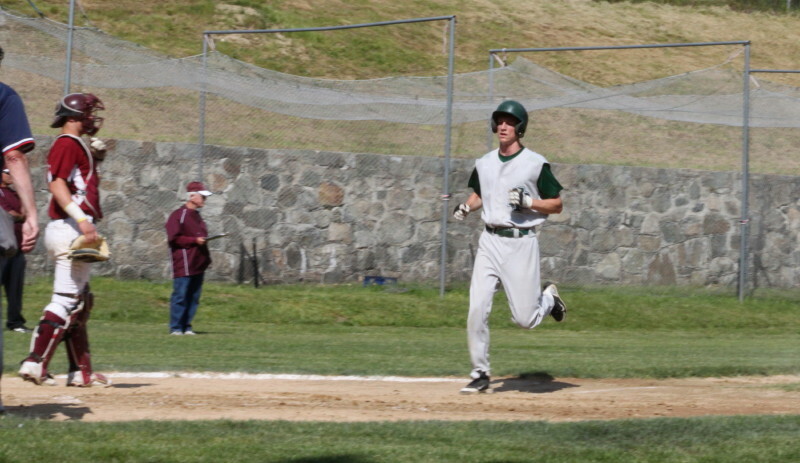 Sam Barlow tallies Newburyport’s first run in the third. 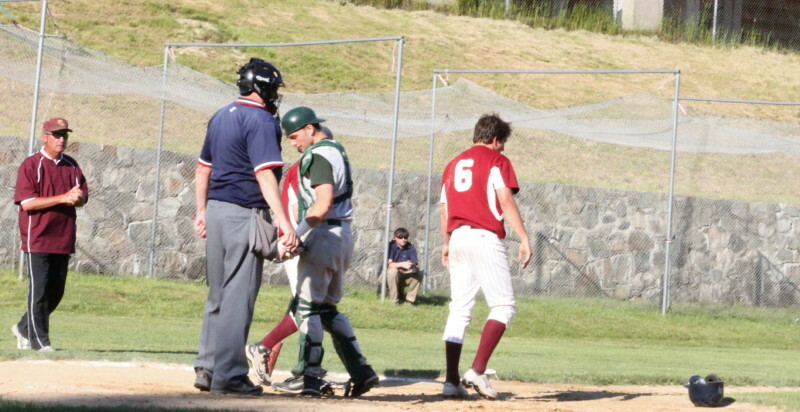 Newburyport received two gift runs in the third inning. A two-base throwing error by left fielder Mark Mezzina followed Clipper singles by Sam Barlow and Colby Morris. Sam scored on the error and Colby reached third. He later crossed the plate on a MacEachern wild pitch. The Cougars got a gift run in the fifth inning. The visitors from Reading, loaded the bases on a single (Chris Bundock) and two walks. Jon Saurman (pinch running for Chris Bundock) reached home on a Fontaine wild pitch. Newburyport erupted for six runs in the bottom of the fifth and that was enough to carry them in with an 8-3 win. Catcher Connor Wile made a nice play on a popup in the fourth inning. Winning pitcher Brett Fontaine had seven strikeouts to go with three walks. 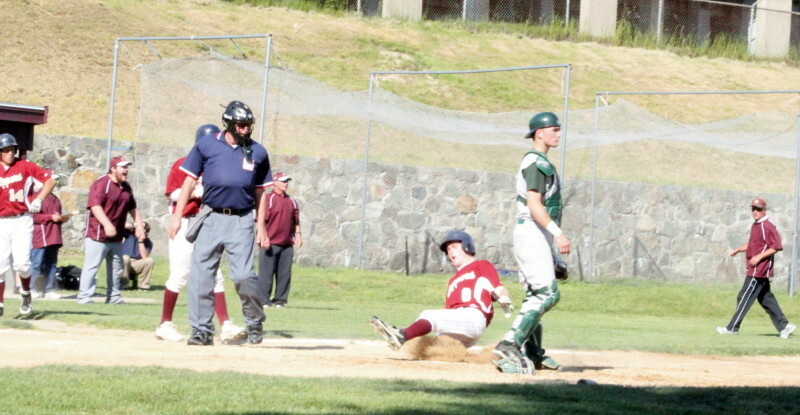 Newburyport had eight hits including two each by leadoff batter Colby Morris and left fielder Jim Conway. Colby also scored two runs. Ryley MacEachern had two of the four Cougar hits, including the long home run to left in the sixth inning, and two RBI. Austin Prep stranded five runners.